Social Support for Health: An Increased Role in Health Care? Social support is vital to health and quality of life, and its absence can be deadlier than smoking cigarettes. Yet, despite its benefits, social support does not have a defined role in the health care system. Recent news articles suggest that recognition of the importance of social support in health may be on the rise. In January, we wrote a blog highlighting the “hug a day study” which demonstrated that receiving hugs protected people against against flu-like illnesses. This study received wide coverage in the media, including Time magazine, the Washington Post, and the Huffington Post. 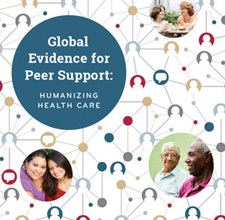 Our blog has covered peer support in many populations around the world, but we rarely talk about adolescents and young adults. Traditionally, health interventions directed towards adolescents have struggled to produce positive behavior changes. However, there is reason to believe that peer support can succeed in engaging this population where other approaches have failed. Diabetes care in adolescents is often compromised by non-adherence, a significant contributor to poor glycemic control that is related to anxiety or fears about being judged by peers and adolescent development issues. Previous research in this area has focused on peer support from friends without diabetes or group learning among patients of the same age.